Working on a completely different track and then all of a sudden being able to work on something you are passionate about. Sounds a great story, right? Also when you are not only financially independent, but also take care of your family and also be famous at the same time? Does this sound too good to be true? Well here is the story of a man who does exactly this and is super successful at it. 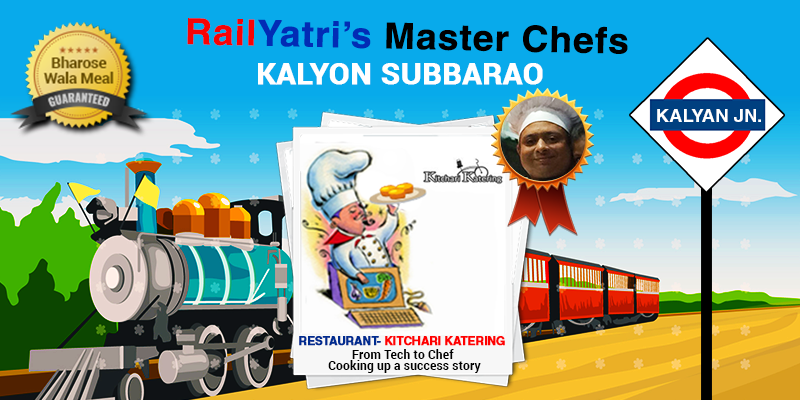 Meet our RailYatri’s Masterchef – Mr. Kalyon Subbarao. How a techie turned into a chef? Mr. Subbarao has a corporate career spanning of over 14 years. This complete cooking story started when he was working outside India for a multi-national organization. While living there independently, he used to cook for himself. Preparing more and more meals himself, for his friends, soon his food gained popularity amongst his peers. Mr, Subbarao, himself found an immense amount of interest, passion, and satisfaction in experimenting with his meals. He realized as if as he has found, the real motive o his life! By now, Mr. Subbarao had well understood his true love. He returned back to India and started his own catering services known as Kitchari Katering, at Kalyan. According to Mr. Subbarao, “I love preparing and offering best, experimental as well as healthy food to people and I am slowly and steadily working towards it”. Kitchari Katering defines Mr. Subbarao’s passion. Every meal is prepared with the expertise of Mr. Kalyan Subbarao. With the help of its 6-member kitchen team, they serve scrumptious North-Indian as well as typical “Bambaiyya” cuisnes, such as Pav Bhaji, Vada Pav, Biryani, etc.Going a step ahead, Kitchari Katerers is also into food delivery on trains. Mr. Subbarao’s association with RailYatri gives a chance to our train travelers to enjoy meals prepared out of much love and passion. A Food blogger and true to heart food evangelist, Mr. Subbarao’s story truly depicts that it’s better late than never, to pursue your dreams. Shun oily, spicy food and say Yes to hygienic, tasty food on the go! Please give me subbarao ‘mobile number I have very important suggestion. We have a confidentiality contract with all our food partners. Keeping that in mind, we cannot share their contact details. If there is any suggestion, please write back to us at feedback@railyatri.in and it will be passed on to the food partner.